I have been hanging around for a while, and I love this forum and the work that the Flite Test team is doing. I built an Old Fogey and it turned out ok. I was hoping to be able to fly it outdoors on calm days, but it turns out it can hardly take any wind at all. The foam I built it from is very light, about 0.09 g/sqin if my kitchen scale can be trusted, so I think my build is more wind sensitive than "the original". My foam is also way more "bendy" than depron for example. Side wind keep tipping the plane over. 1. The wings keep folding in the wind gusts, especially if I happen to use more throws at the same time. I'm considering putting a fold-over airfoil wing on it. Would that help? It would definitely help with the sturdiness of the wing, and it would increase the weight which I guess is a good thing (although that could be fixed with more battery), but does it also help against the wind tipping the plane over? I'm thinking the polyhedral makes the wind grab the wing "from the side". 2. The profile of the fuselage is huge. Is this what causes the plane to tip over? If so I don't have any ideas for how to fix that, but would gladly take suggestions. 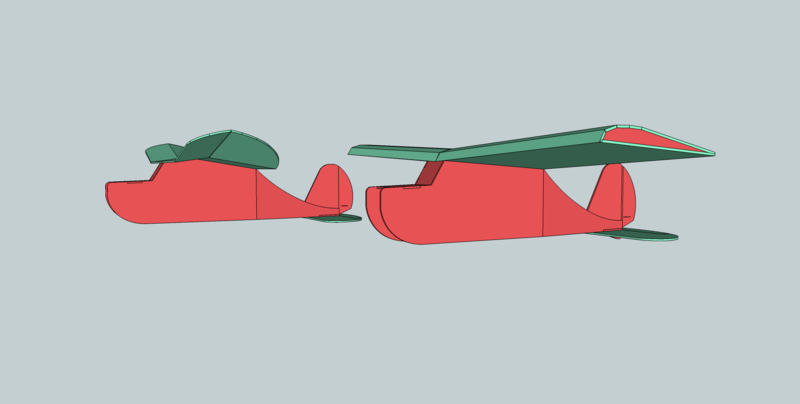 Here's a sketchup model with a (slight) dihedral airfoil wing, next to the original Old Fogey. The wing span and cord are the same. Comments? This wing does not have any under-camber at all, should I add some? I would love to hear general comments about what makes a plane fly better in wind (other than the obvious size and weight), doesn't have to be related to this plane! 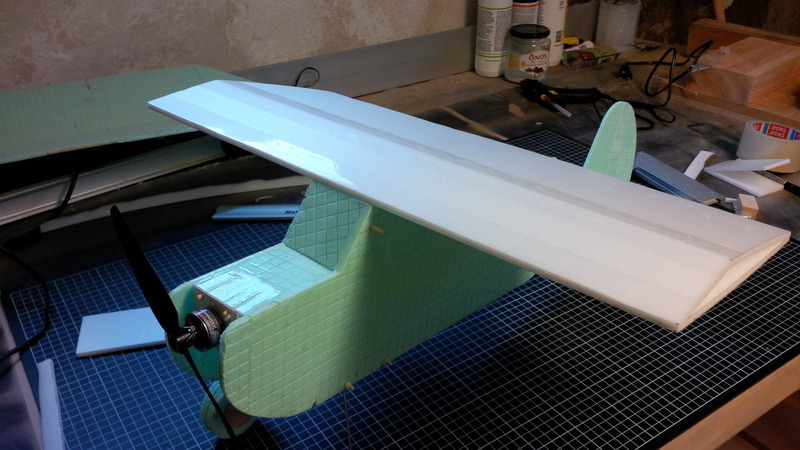 Since I built this plane I have found better quality foam board (which I would likely use if I build an airfoil wing) and of course I could just build another plane more suited for outdoor flying, but I find this an interesting project, and I hope to learn a thing or two about what makes a plane have a certain behavior. 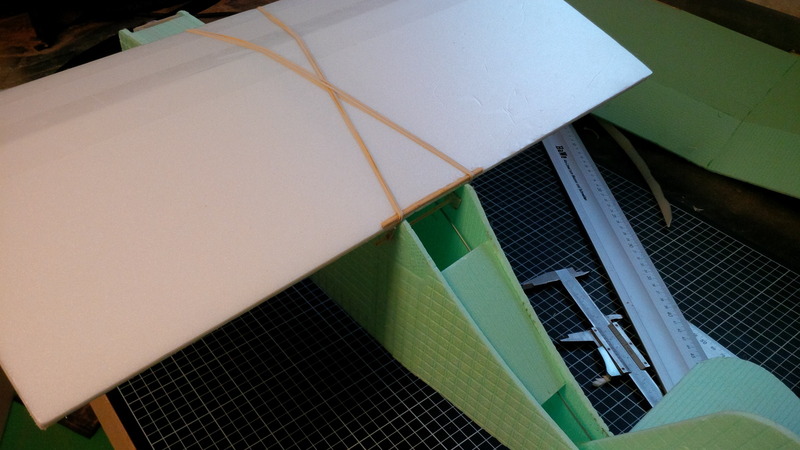 You can make the wings sturdy by covering them with paper. It is common on WWII combat planes. 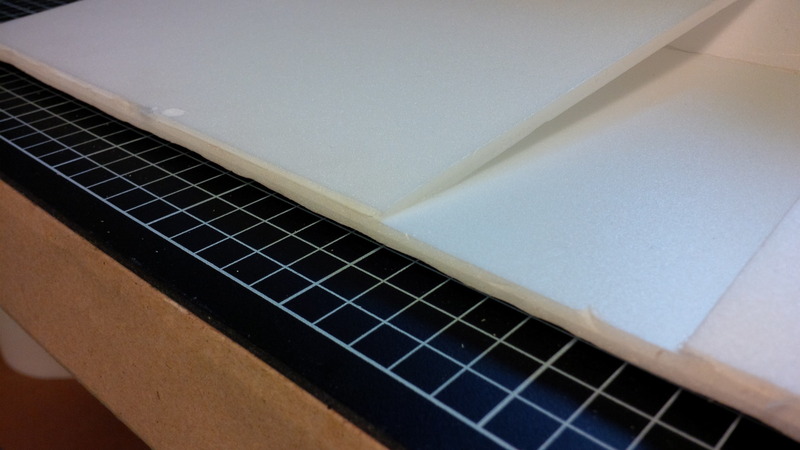 White wood glue mixed with water to soak the paper before applying it to the foam. Drying has to be with air on all sides if you do not want the wing to warp. Less hedral will make the plane less sensitive for wind but also reduce the self levelling you expect from the hedral. You do not need any under camber on the wing. I have used "box wrapping paper" - thin gift wrapping or flower wrapping will be fine but brown "Craft wrapping" is stronger - not needed on the Fogey. The flight characteristics of the Old Fogey depends on the shape of the wing. Unfortunately those flight characteristics don't really mix well with windy days. Changing the wing may make it behave better in the wind, but you lose the original flight characteristics for which the Old Fogey is know. Swappable wings aren't really an option because the fuselage is shaped to accommodate the undercamber. Rather than change the Old Fogey, why not choose another design for windy days, such as the FT 3D, FT Spitfire or FT Cruiser? You might need more power in your power pod for these three planes, but you may need more power in the wind anyway. Dollar Tree foam is about 120 grams per sheet, which works out to about 0.2 grams per square inch, or about twice the foam you are using. That is easily a large part of why your plane gets tossed around more easily in the wind than one made with DT foam. 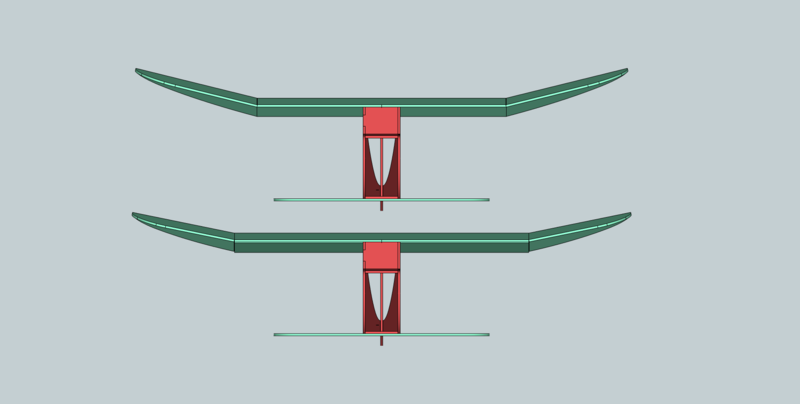 Since you can add plenty of weight and still stay under the DT version, the easiest thing to do is just add a carbon spar to the central section of the wing. If you want to stiffen the plane up further, you can cover it with tape. The best way to do this is to apply the tape to the paper before you cut out your parts, and you want to apply the tape under tension. I've found that a gust over the wing causes the plane to pitch up, and you need to quick to apply down elevator to keep the plane under control. You might want to fly with extra nose weight on windy days. The Old Fogey wing is designed specifically to provide high lift at slow speeds. If you go to something like a Clark-Y, you are going to need a bit more speed to achieve the same amount of lift. This may, or may not, be what you are after. 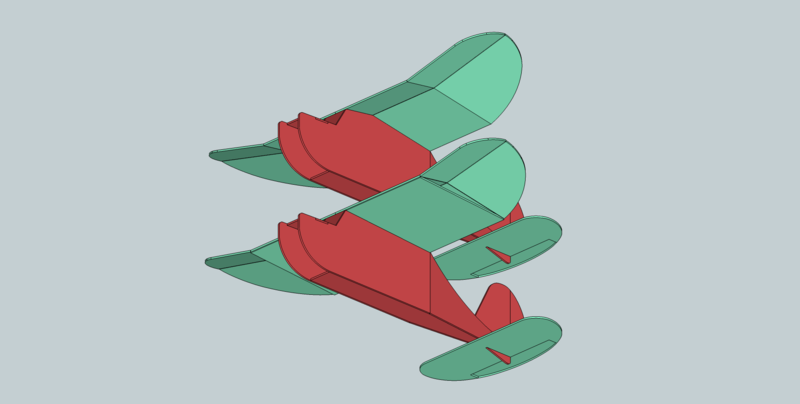 If you want to get rid of the dihedral, you are going to need to add ailerons to stabilize the plane. Again, this may or may not be what you want. You may also want to consider a Jedelsky airfoil which is very much a hybrid of the "bent plate" used by the Old Fogey and the Clark-Y. 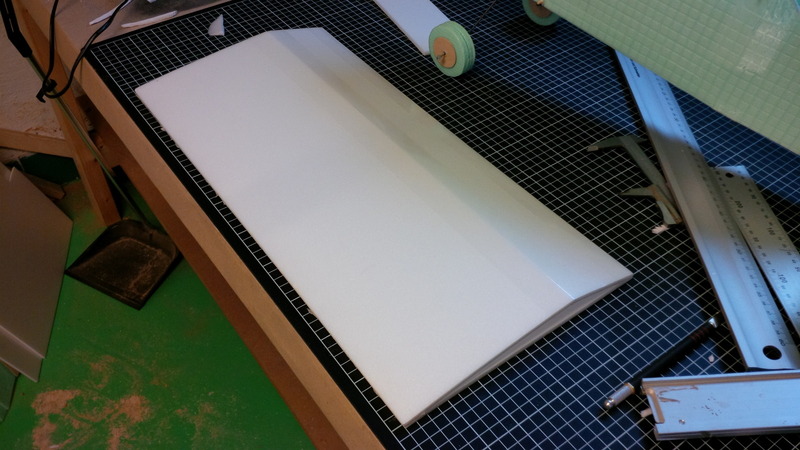 Simply adding foam to the bottom of the center part of the wing will help to stiffen it up. The added bonus is that a flat bottom airfoil creates less lift than an under cambered airfoil. So the wing tips will be creating more lift that the center part of the wing which will make the plane self level even more, so you could make the wing tips have less dihedral and still behave the same. 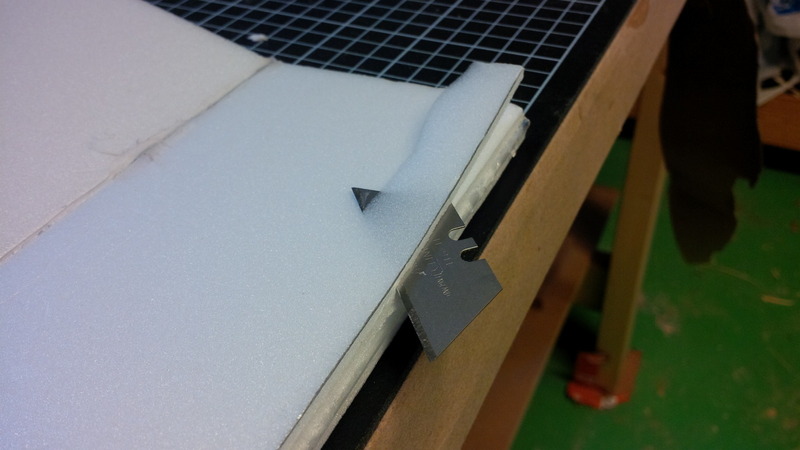 You don't need complicated bends in the foam like in your picture, you can just have a triangle shaped airfoil. Doing it that way will allow you to keep the wing tips exactly the same, but with less dihedral. But heavy is good in the wind. 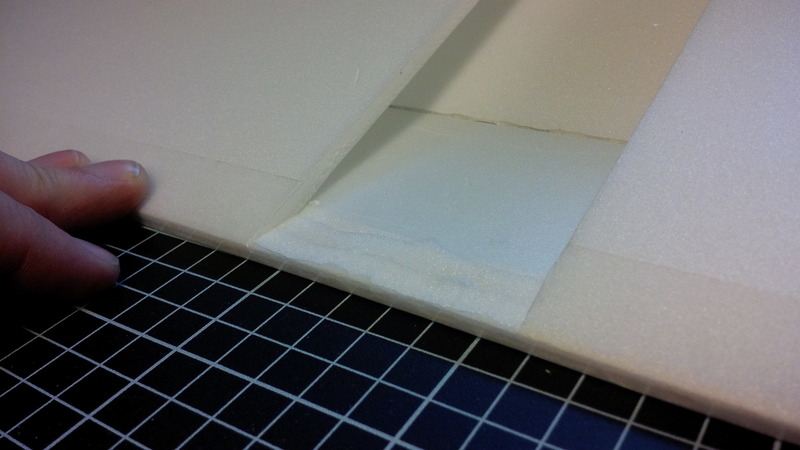 Simply adding a layer of tape or paper to your current plane will stiffed up the foam and make it a touch heavier. Doing what pgerts said to do with the watered down wood glue and paper will work. It's like a paper-machee covering. Foam is surprisingly strong when a covering is added. The wingtips are likely causing the "tip over" since they are designed that way. When you kick in some rudder, the wing to the outside of the turn presents itself to the wind and increases the lift to bank the plane like it has ailerons. The problem is, the same thing happens when in a cross wind. I guess a solution could be to make a "clipped" wing version where the tips are shorter to make the effect minimal, or reduce the amount of angle on the tips. It should be easy to modify a wing or two to fly on the same fuselage with no other modifications. One thing I would do, since you are using a much lighter weight foam, is to brace or cover the foam with tape under a slight tension. you'll be surprised how rigid you can make it with a bit of packing tape spanwise under a touch of tension. Thanks for this great response! I really appreciate it. What I take away from all of you is that the wing tips are probably the main culprits. @RoyBro Yeah, I realize I would be converting it to a completely different plane if I put on a Clark-Y (thanks rockets4kids) airfoil. I could build another plane, but I want a high-winged one (I'm a noob pilot as well, not only builder ) so I would probably end up designing something on my own anyway. I will definitely add some weight and sturdiness to the fuse and control surfaces/stabs by covering it somehow, paper, tape or Oracover which I bought a piece of for testing. 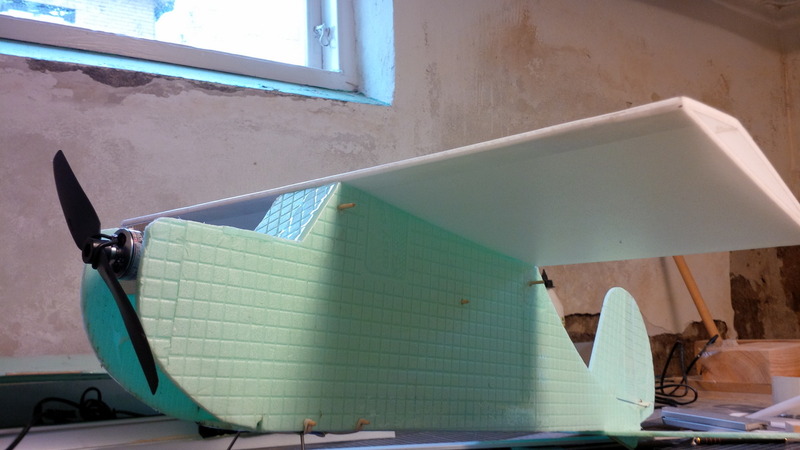 I'll build a new wing using the sturdier foam I found (density and stiffness rougly like depron). I liked the idea of sticking to the simple shape of the wing, but cover the bottom with foam. That's probably what I'll go with for the new wing. How does this sketch look to you guys? (New wing on the bottom.) I've extended the middle section, shortened and lowered the wing tips. I might put in a CF tube if needed. Would you lower the tips more? Make them even shorter? The foam sheets on the bottom does not go through the fuse, so the original wing would still fit as well. 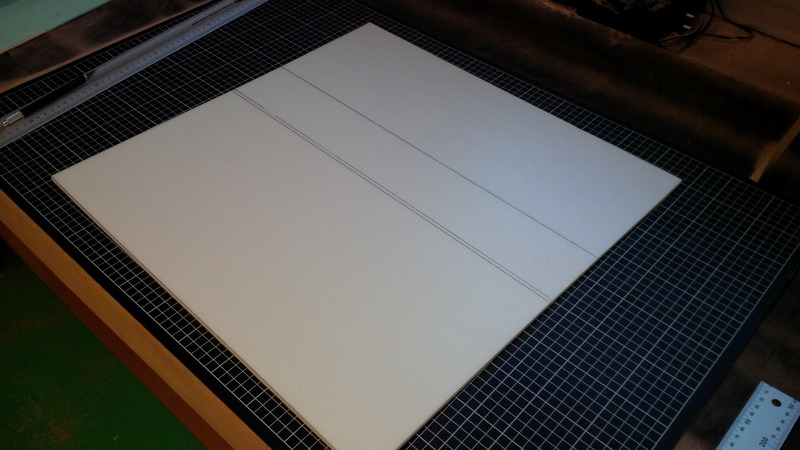 The middle section is made out of a single piece of foam. The lines are all score cuts. This foam has no paper surface, so I put packing tape on the opposite side, centered over the score cuts. Test fitting the bend before gluing it. 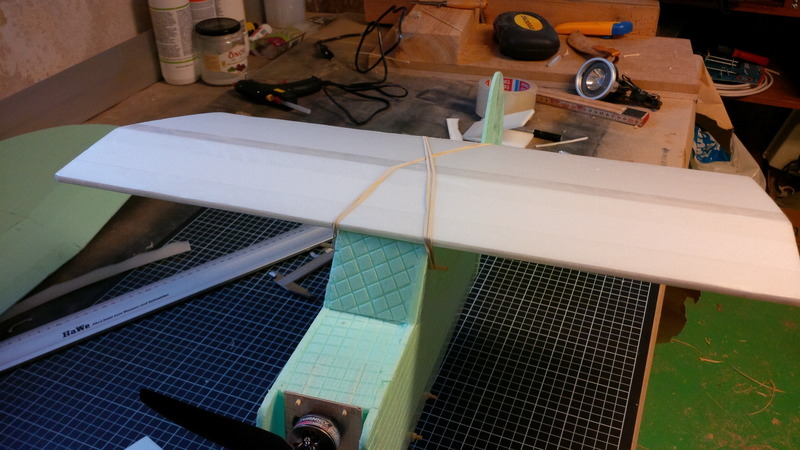 Here's your first glimpse of the ugly foam I originally built the plane from. I'll probably end up swapping out piece by piece for the white one. "A nice thick bead of glue." as Josh would've said. ...on both sides of the groove. These were quite tricky to get nice and even. 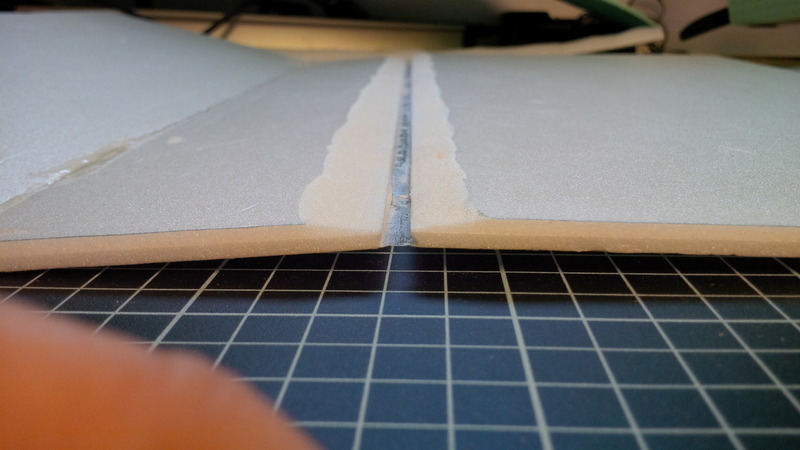 Hot glue on the surface of the cut and fold it up. 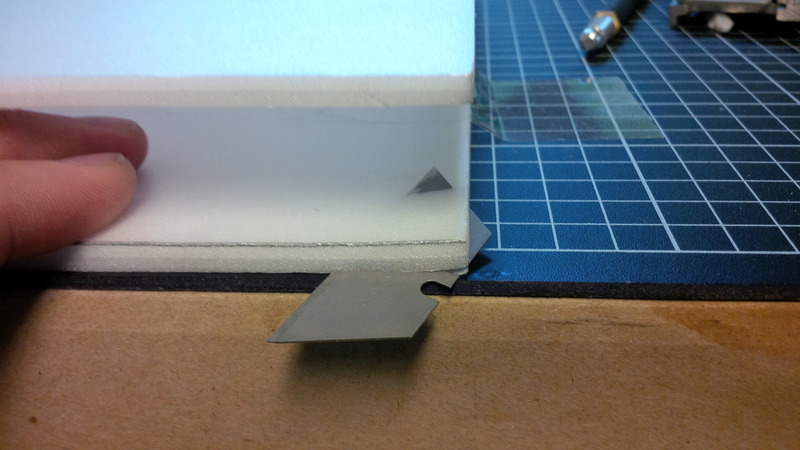 Lay the wing flat while applying the glue, then fold both surfaces up, so that the leading edge is pressed against the table. The groove should be tight enough to press the surfaces against each other, so focus on getting both edges pressed against the table. Cut away for the fuselage. Take special care along the leading edge. You want to leave basically as much as the thickness of the foam. 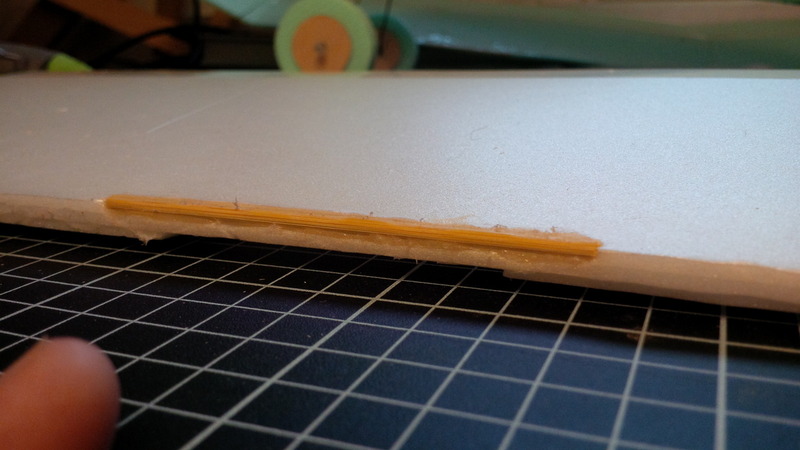 Don't cut away all of the bottom foam all the way up to the edge, or you'll only have half the thickness. 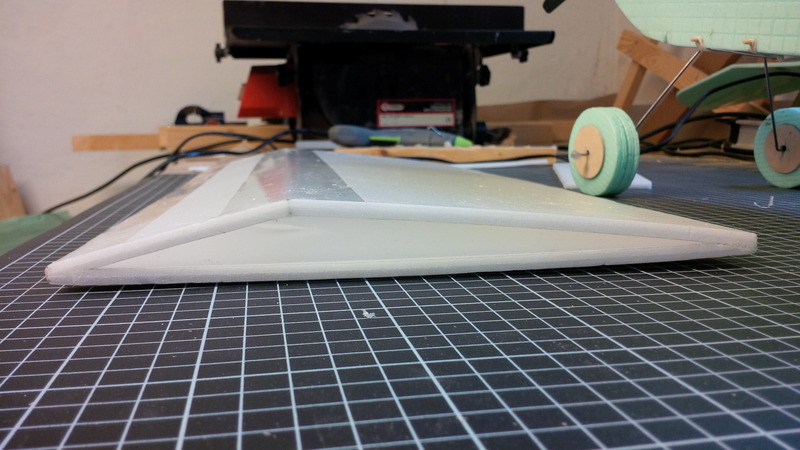 An alternative would be to do this before gluing the leading edge, and not slant off the top foam where the fuse goes, but I figured I would get a better leading edge by gluing it in one piece. 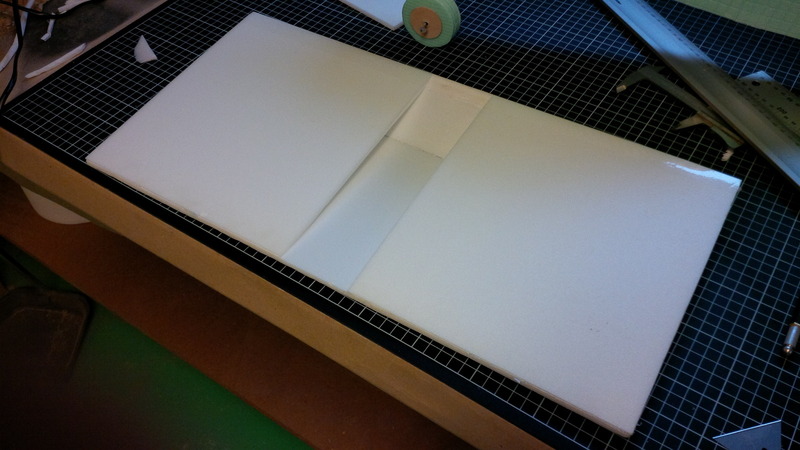 Here you can see how some of the material from the bottom foam is left to fill up to full foam thickness. ... the middle section is basically done. A view of the top. 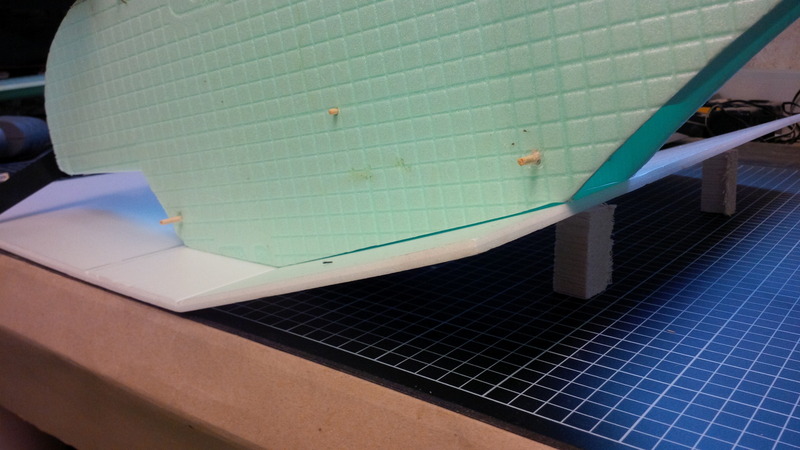 Here you can see how little was left of the bottom foam along the trailing edge. So this is the profile of the new wing. Maybe I'll stick a CF tube in here, but it doesn't feel like it will be needed. I quite like the looks of the flat bottom. Cut a groove for and glue a barbeque skewer into the trailing edge. I need to do something at the leading edge too, but I don't want to use this method because of how the leading edge joint was done. I'll probably end up just sticking a popsicle stick under the rubberbands. By not carrying the double thickness though center section you have created a weak point where you need strength the most. My suggestion would be to make the wing solid and modify the fuse to accept it. You will also find that by adding a foam spar at the thickest point of the wing you will considerably increase strength and stiffness while adding only minimal weight. I am still not sure how the characteristics of the wing will change by directly replacing the under-camber with a flat bottom. I know that both thick and under-cambered wings both generate a lot of lift, but I think that under-cambered wings are better-suited for slow speed flight. In particular, I believe that the under-camber is less sensitive to stall, which is why many of the FT wings utilize a flat bottom in the center and an under-camber at the tips. This is to prevent what is known as "tip stall." As to the dihedral, you want only enough so that the plane flies straight and stable with no control inputs. The excessive dihedral on the default Old Fogey wing will cause it to return to straight and level flight very quickly once the controls are neutralized. Yes, I have thought about that. It is still considerably stiffer than before though, since the bottom foam prevents the bend at the top from bending back. If I see the wing is still "bendy" in that area, I'll add a CF tube, or a foam spar like you suggest. That's the best part about working with cheap foam -- it costs so little to experiment and make discoveries on your own! The tips provide more than self-righting tendencies, they help bank when rudder is applied. Think Nutball and it's upturned outer wingtips. Try about 1/3 to 1/2 of the original break angle. what you had in the sketch seemed to be just about right. But like R4K said, it's cheap to experiment with. 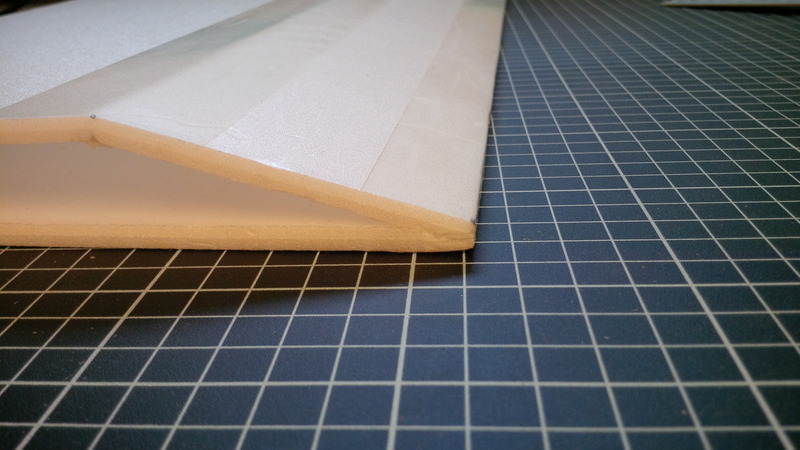 If it shows any tendencies to want to fold at the center, a full length foam spar in the middle section should distribute the load enough to offset the center cutout section. I believe the sharply upturned wingtips are what allow the Old Fogey to turn so quickly at slow speeds. There are plenty of 3-channel planes which turn without any wingtips at all and only slight dihedral. Some planes rely on belly weight to self right. Since your foam is so much lighter, you could add some weight without loosing too much of the planes floaty-ness. The best extra weight is a bigger battery. But if you hung your battery low on the plane with some added weight, it would be a bigger lever to self right the plane and you'd be able to get away with less dihedral on the wing tips. It is, but both types work using the same principal where the bank angle or yaw input modify the amount of lift the wings generate. And what Rcsf is getting at is to make the fuse more like a pendulum to provide greater stability. You'll still need some of the polyhedral to turn with bank or it will do nothing but flat turn. Try only one or two of the modifications at a time to gain a better feel of what is working and what is not.